The Polytechnic staffs includes those employees who are in teaching as well as non teaching roles in the polytechnic colleges, which provide technical education to the students admitted for diploma courses in engineering and technology. The pay scales of the polytechnic colleges depend on the salary structures mentioned in the ongoing central pay commission. The pay scale is determined by the level of pay band in the pay matrix table. In the year 2010, all the polytechnic staffs were given salary as per AICTE norms. The teaching staffs of the polytechnic colleges receive their salary ranging from pay bands of Rs. 15,600 – Rs. 39,100 and Rs. 37,400 – Rs. 67,000 depending on their ranks. The staffs of the polytechnic colleges and institutions are getting their salary as per the 6th pay commission and AICTE norms. The salaries of the polytechnic staffs depend on the basic pay and several other allowances given by the central govt. under the AICTE norms. 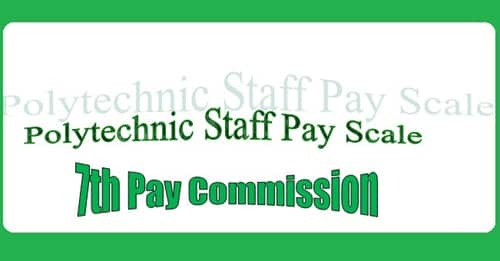 The total salary drawn by the polytechnic staffs includes the pay band, grade pay and other applicable allowances. The grade pays of the polytechnic staffs are given as per their academic qualifications. The non – teaching staffs have a lower salary than the teaching ones in the polytechnic institutions in the country. Before 2010, the polytechnic staffs had a big difference in their salary in comparison to the central govt. employees of the AICTE. Grade pay plays a very important role in determining the salary of the Polytechnic staffs. The grade pay is added directly to the pay scale / pay band of the staff to calculate the net basic salary of the polytechnic staffs. The polytechnic staffs’ grade pays are determined and fixed as per their academic qualification and also years of experience in the service. Thus their grade pay is termed as Academic Grade Pay or the AGP. All cadres of polytechnic staffs receive the academic grade pays as per their rank and educational qualifications. The minimum AGP provided to the polytechnic staffs is Rs. 5,000 to the newly appointed assistant lecturers and librarians. Whereas the AGP which is given to the senior most ranks with higher educational qualifications like the ranks of head of the departments and the principal is Rs. 10,000. Apart from the normal salary mentioned in the pay band including their academic grade pays, the polytechnic staffs also get several allowances and service incentives. These allowances make their per month salary up to some more extent. Several allowances that the polytechnic staffs get are according to the allowances mentioned for the central govt. employees in the ongoing 6th central pay commission. Dearness allowance is provided with the basic salary which is a major part of their net per month salary. At present, the rate of DA is 125 per cent for the central govt. employees. The several other allowances which the polytechnic staffs get are leave travel allowance, allowance for their children’s education, allowances on home rent, allowance for service deputation. There are also some compensatory allowances which are provided to the polytechnic staffs which are provided as per their area of posting. The travelling allowance given to the polytechnic staffs who are physically disabled is double the rate of normal staffs. The AICTE provides a special kind of leave permission named as ‘Study Leave’ to the teaching staffs of the polytechnic institutes. A lecturer who has a degree of M. Tech. And want to upgrade his / her educational qualification to Ph. D. can apply for this special leave for studying purposes. During this leave, all the regular salaries and allowances will be provided. For female polytechnic staffs, a special maternity leave is provided to them. The pensions and gratuity facilities are provided to the polytechnic staffs as per the recommendations of 6th pay commission. The polytechnic staffs get pension benefits after their service retirement. The ceiling of gratuity benefit at present is Rs. 10 lakh per central govt. employee. As per the recommendations of the 7th pay commission, more than 47 lakh central govt. employees and 53 lakh pensioners will get directly benefited. This will include all the polytechnic staffs as they will also get their salary structures revised. The fitment factor for the new 7th pay commission is 2.57. Thus after the implementation of the 7th pay commission, the polytechnic staffs will get a hiked pay of 2.57 times, of their basic salary. The gratuity ceiling in the earlier pay commission was Rs. 10 lakh per employee. This gratuity ceiling has been raised in the new pay commission to Rs. 20 lakh. Apart from this, the govt. has also announced that whenever the DA rate increases by 50 per cent, the death gratuity also increases by 25 per cent. The several allowances provided by the govt. as per the AICTE norms to the polytechnic staffs will also get revised. However, some existing allowances will be permanently discontinued.